Historic Palermo, the capital of Sicily, is a busy port and thriving city. 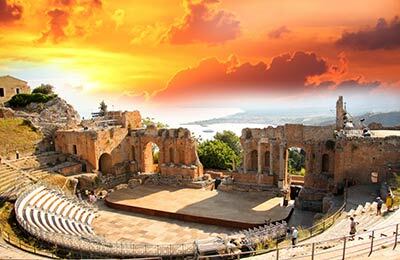 Palermo possesses an exciting mix of cultures shaped by its history of occupation whether Arabic or East Germanic. You can compare and find the cheapest ferry crossings available from Palermo with our easy to use booking form. The ferry companies that operate out of Palermo are Grandi Navi Veloci, SNAV and Tirrenia. Below, you can find all the Palermo ferry timetables, journey times as well as our latest and best prices. Grandi Navi Veloci ferries, founded in 1992, is an Italian ferry operator which connects Italy and Sicily with Sardinia, Spain, Tunisia, Malta and Morocco. They operate an impressive fleet of conventional and cruise ferries. They offer a wide selection of cabins, including disabled cabins, all with en suite facilities. On board you will typically find full and self-service restaurants, a snack bar and shops. On board some larger ships you might also find a cinema, swimming pool and even a gym. From Porto Torres, they go to Genoa, Livorno and Malta. SNAV ferries is a major ferry company in the Mediterranean connecting Italy, Greece and Croatia. From Palermo, SNAV ferries go to Civitavecchia and Naples. SNAV has the latest and the fastest fleet in the Mediterranean largely made up of hydrofoils and catamarans capable of high speeds while still offering comfortable journeys. On board all SNAV catamarans and hydrofoils you will find cafes and snack bars. Tirrenai ferries has a fleet of ships is mainly made up of brand new super fast ferries that can travel comfortably at very high speeds. From Palermo their ferries go to Naples on the Italian mainland. All Tirrenia ferries provide a wide range of on board facilities including a bar, full and self service restaurants and shops. On board you will also find spacious cabins furnished to high standards and a wide variety of seating options. 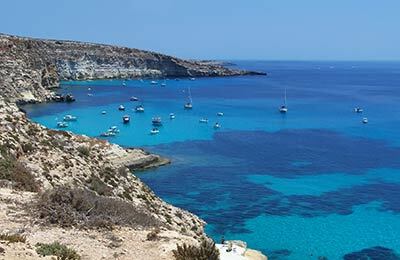 Book your ferry to Italy, Tunisia or Malta from Sicily's historic capital simply and securely with AFerry. Palermo is the largest port on the island of Sicily and offers regular connections between Sicily, mainland Italy and north Africa. All ferries from Palermo can be booked online through AFerry. Palermo port offers a basic level of facilities. It is also set in the heart of the town, meaning you are never more than five minutes walk away from a cafe or restaurant serving an excellent quality of food and drinks. Palermo is well served by fast trains and buses to destinations all over Sicily. It is also well sign-posted from across the island.